Starring: Nicole Kidman, Julianne Moore, Meryl Streep, and more. Requested Review from Scot Scholl! There is something both brilliant and painful about watching films like this. On one side, stories are being told that are never brought to the light beyond the people suffering or experiencing these stories themselves. Yet on the other side, it is absolutely heart-wrenching to watch a film about that same suffering. But remember, we are seeing it in film… People are living through certain life experiences as depicted in this film or any film concerning similar subject matter. These stories deserve to be known… Well, if that is not an intro enough for the film review you are about to read, I don’t know what else is. Be prepared if you wish to see this film some time. Here we have another Oberrated Requested Review. Requested by my friend, Scot Scholl, we have here a 2003 Oscar Best Picture nominee, ‘The Hours’. Starring three powerhouse females, Nicole Kidman, Julianne Moore, and Meryl Streep. Virginia Woolfe (Nicole Kidman), Laura Brown (Julianne Moore), and Clarissa Vaughan (Meryl Streep) are three women who have a common connection in the form of a novel titled “Mrs. Dalloway”. This novel affects the three women in different ways as the four share another common connection in the form of suicide and depression. ‘The Hours’ is a very painful and difficult story to watch unfold. I do not mean that in the form of it being a bad film, the subject matter is just that hard to wade through. As I teased about in the introduction, films like ‘The Hours’ or similar to it bring certain subject matter to light that many people may not experience first hand or may not even experience through association but they are very real stories that exist in both past and present times and will continue to exist in the future. I appreciate these films an incredible amount. As hard as it is to watch sometimes and as emotion-provoking as they are, the awareness they raise is important. I spoke previously about the powerhouse females in this film and my oh my do I mean that. The performances brought about in this film from Meryl Streep, Julianne Moore, and Nicole Kidman are absolutely phenomenal. They pour everything they have out into their scenes and it is simply magic at work. Not only did the three leading women rock the film, I was not let down by any of the supporting characters. Ed Harris as Richard Brown and Jack Rovello as Richie were by far my favorites but again, everyone who came to the screen owned their performances. 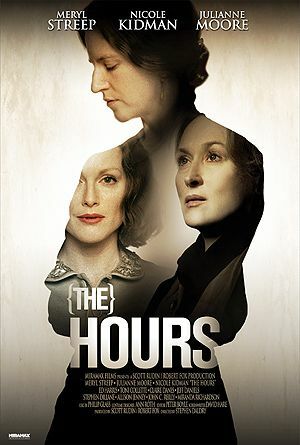 An incredible outing by the cast of ‘The Hours’. An additional note goes to the score of this film. Any scene in which there was music was absolutely beautifully done. My only negative note I can bring up is that the pacing goes a little too slow for my taste around the middle of the film, even with the understanding that this is a drama. I fully anticipate the slowness and expect the story of a drama to take me in and keep me invested but it dropped to a crawl in the middle, in my opinion. ‘The Hours’ is a phenomenally done drama. Stellar acting, an important story to bring awareness to, and overall just a moving piece. I can definitely recommend a watch but anticipate watching some puppy videos afterwards or something. Posted in Movie Review, Oberrated Requests.Tagged Julianne Moore, Meryl Streep, Nicole Kidman, Stephen Daldry, The Hours.